The Liebert Cold Aisle Containment system ensures that the cold air flowing though the raised floor is channeled through the cabinets. As a result all installed servers are provided with consistent cold air over the entire height of the cabinet. Customized cold aisle containment using standard components - compatible with all manufacturer cabinets. equipment, suitable air temperature intake for servers, more pleasant working conditions). The higher intake air temperature also allows the inflow water temperature to be increased, which results in further energy savings. Plus, higher inflow temperatures provide more time for cooling through free cooling. This Cold Aisle Containment saves "tons" of energy costs, and therefore makes a massive contribution to environmental protection. 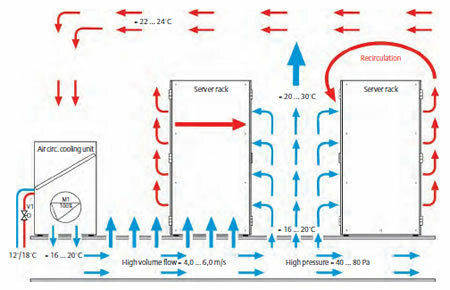 In conventional data centers, high volumes of cold air, which must be below 18�C in places, are blown from the raised floor into the cold aisle. The reason for this is that the cold and warm air in the data center frequently mix (especially when a data center reaches its full capacity). 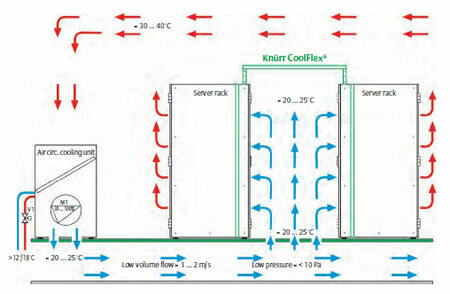 Many data canter operators therefore increase the volume flow and reduce the intake air temperature, until the desired temperature is achieved in the cold aisle. This consumes huge amounts of energy. The result: at the bottom of the cold aisle there is a temperature of 16 - 20�C; at the top there is a temperature of 22 - 30�C. 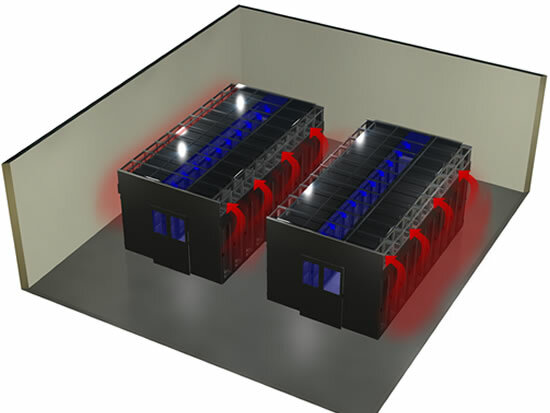 At a data center's full capacity temperatures above 30�C can often be generated in the cold aisle with the recirculation of the warm is out of the warm aisle and into the cold aisle. Is the Liebert Cold Aisle Containment the best solution for your containment needs? Our engineers can help you select the best data center cooling solution for your cooling needs. Click here or Call 1-800-638-2638 for a free data center cooling project evaluation. - Save Big with Aisle Containment! The Right Hot Aisle / Cold Aisle Containment strategy is an economical way to maximize airflow dynamics, increase data center efficiency, and save costs on your utility bill.